Stockton Town is pleased to announce that Arthur Connelly from our hugely successful Under 15’s has been offered the opportunity to join Middlesbrough FC’s Academy. Arthur has played for Stockton Town now for 4 Seasons and he will be the 4th ex Stockton Town player to join this Middlesbrough squad. 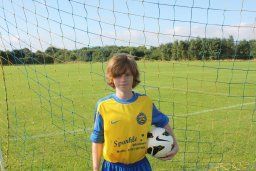 Arthur Connelly has won numerous Trophy’s with Stockton Town and is currently a TJFA League Champion & League Cup winner. Stockton Town would like to wish Arthur every success in the future at Middlesbrough FC and we look forward to seeing you progress as the years go on and once you make your 1st Team début we’ll have your shirt up in the Clubhouse.